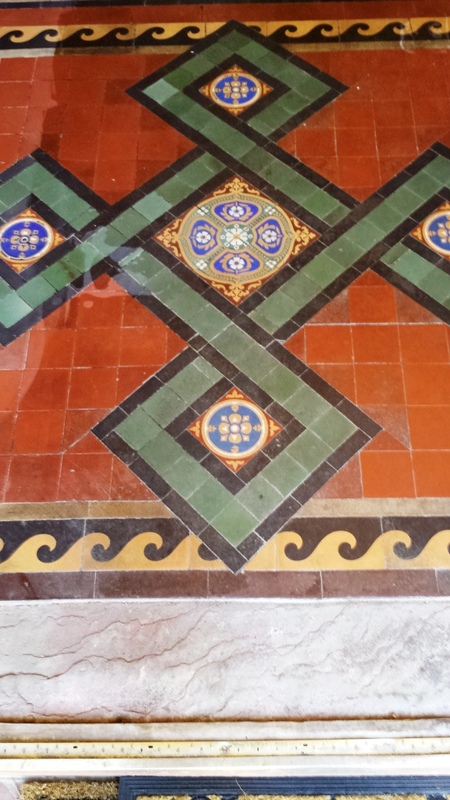 This particular Victorian tiled floor had been installed in the hallway of a house in Stow Park, Gwent around 130 years ago. Despite its age it was in a good condition and the detailed pattern although dirty was still very distinctive, the customer felt however that the floor was spoilt by the total erosion of the stone step at the front door which had suffered from the 130 years of footfall that had occurred across the threshold. They asked me for any suggestions to make it more pleasing on the eye so I chose various colours from the main floor area and created a new entrance step leading to the main hallway comprising of 150 mm x 150 mm original style red and black floor tiles and 150 mm x 75 mm original style black round edge tiles. 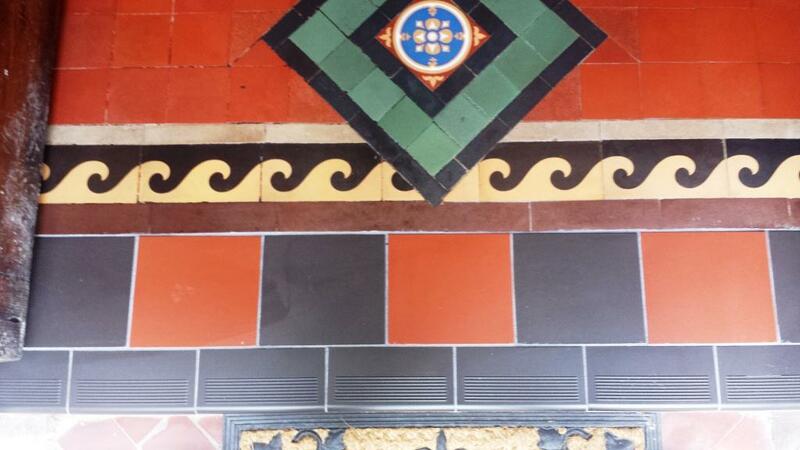 The difference between the old and new was fairly obvious so once the tiles had been laid and the grout had gone off I returned to give the original Victorian tiles a thorough clean. There were some stubborn stains on the floor so I decided to scrub in a couple of strong products called Tile Doctor Remove and Go followed by Tile doctor Grout Clean-up rinsing in between the stages. Remove and Go is a sealer and coatings remover that as well as cleaning will remove old coatings such as sealers from the tile, this is important if you wish to re-seal the floor as you can get unexpected results if you add one sealer on top of another. Grout Clean-up removes mineral deposits such as the white salts from effloresce, rust and grout smears. The floor was given a thorough rinse following the cleaning process to ensure no product was left on the floor that could upset a sealer. Aided by the warm weather it wasn’t long before the tiles were dry enough to be sealed and so I applied two coats of Tile Doctor Seal and Go which adds a nice subtle sheen to the floor as well as providing on-going stain protection. I think you would have to agree my solution worked out well and the new tiles look part of the original floor. 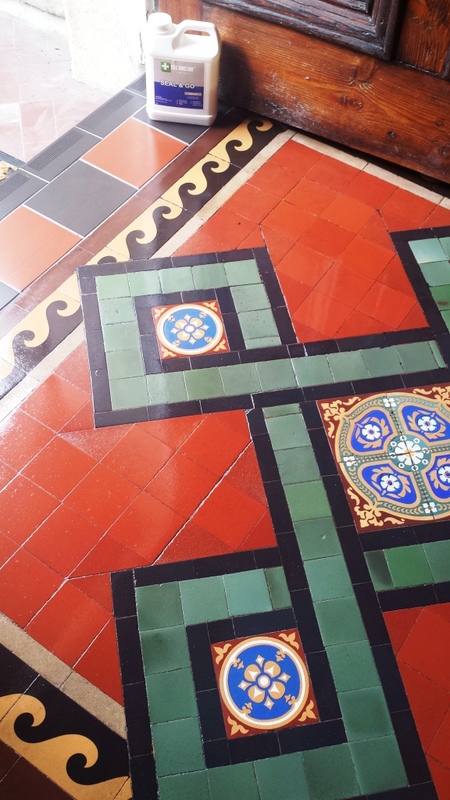 This entry was posted in Victorian Posts and tagged cleaning services, floor restoration, Gwent, hallway cleaning, hallway floor, sealing victorian tiles, South East Wales, tile cleaning, tile maintenance, victorian tiles by AbzDominise. Bookmark the permalink. You find a great match there and the floor looks fantastic.